Posted by: Ash on October 15th, 2016, in Guides. Tags: Amazon Rainforest, Ecuador, Lodges, Top Attractions, Yasuni National Park. Ecuador is home to one of the richest sections of rainforest in the entire Amazon Basin. 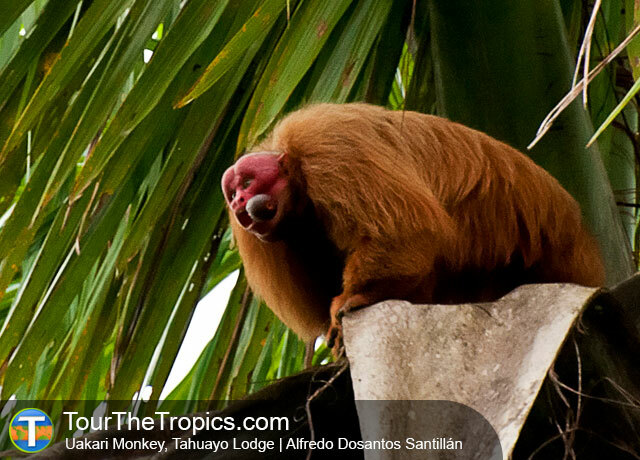 There are some excellent jungle lodges in Ecuador to experience Amazonia and to see iconic wildlife, such as toucans, macaw parrots, many different monkeys, and more. In Ecuador, the Amazonian gateway town to experience the rainforest is called Coca. Here, we will present our guide to the top jungle lodges from Coca to make sure you get the best experience of this incredible ecosystem. But first, an introduction to Coca itself. El Coca is a small jungle town in the Amazon Rainforest of Ecuador. This is also the gateway for Amazon lodges in Ecuador. The town is most often reached by visitors on a short 40 minute connecting flight from Quito. Although known as Coca, the port’s official name is Puerto Francisco de Orellana. Coca is positioned at the meeting point of the Coca and Napo River in the rainforest of eastern Ecuador. This is where the Amazon River forms to begin its journey across South America to the Atlantic Ocean. The river feeds the world’s largest container of wildlife, the Amazon Rainforest, which covers 40% of the continent. There are some excellent jungle lodges from Coca to experience Yasuni National Park, which is one of the most species-rich protected areas in Amazonia. However, the surrounding rainforest of Yasuni National Park and Cuyabeno Reserve is also filled with similar wildlife. From these lodges, enjoy comfortable accommodation and incredible wildlife tours. Your guide will help you explore the rainforest to find many monkeys, colorful birds, and more. 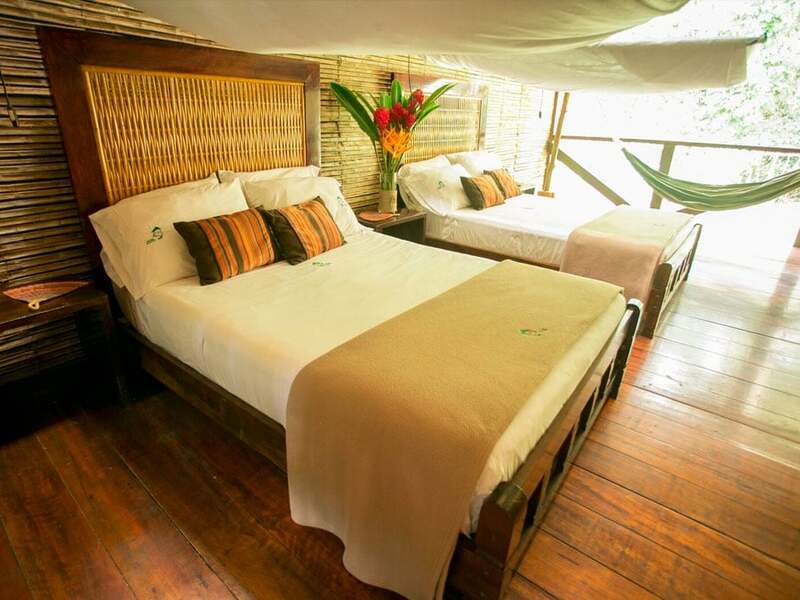 Here, we present the best lodges for experiencing the Amazon Rainforest from Coca, Ecuador. 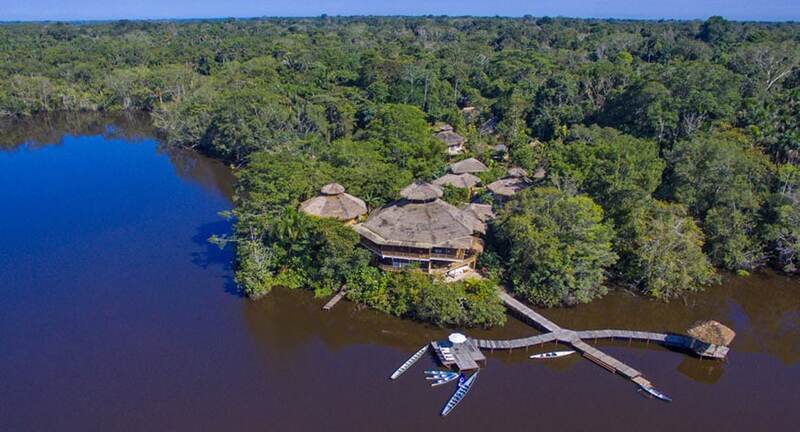 The most comfortable lodge in Ecuador and one of the top luxury Amazon Rainforest tours, La Selva Lodge provides a fantastic base to explore the surrounding Yasuni National Park. 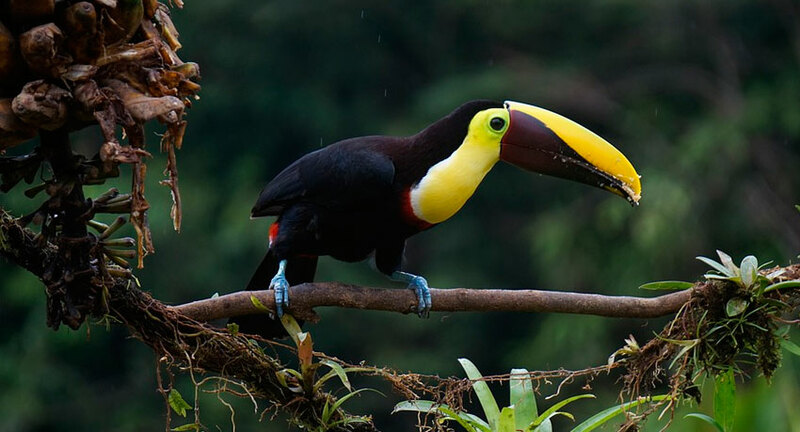 In addition to very comfortable suites, enjoy canoeing wildlife-rich areas, climb a tall canopy tower to watch toucans and parrots flying over the forest, and see the Yasuni clay lick to spot parakeets feeding on salt-rich clays. You will also enjoy guided tours through the rainforest to see giant trees, several different monkeys, colorful birds, and a diversity of other rainforest plants and animals. The many trails around La Selva Lodge have been carefully positioned to show off the best areas and take you through the most wildlife-rich sections. Walk past giant kapoks, fascinating strangler figs, and beautiful lakes. In addition to the wildlife expeditions, you will enjoy delicious food back at the lodge and comfortable suites with king beds, luxurious linen, private bathrooms, private balconies, and rainforest showers. You can also enjoy the La Selva Lodge spa for a range of massages and treatments to fully relax in this incredible environment. Despite being a luxury-level lodge, La Selva Lodge is committed to sustainable tourism in this delicate environment and is Rainforest Alliance verified. Another favorite lodge offering a high level of comfort, the Napo Wildlife Center is positioned on the Napo River and provides fantastic tours into Yasuni National Park. Enjoy the main hall with wildlife books in the small library, the full-stocked bar, and a restaurant serving delicious meals. There is also a 20 foot high observation tower for 360-degree views of the surrounding rainforest and nearby lake. The tower is perfectly positioned for ease of access and you can see toucans and colorful parrots flying high over the rainforest from the comfort of the lodge itself. You will also enjoy very comfortable suites with 24/7 electricity provided by solar panels, ceiling fans, private bathrooms with hot water, and a private balcony with views of the lake and rainforest. The Napo Wildlife Center provides a fantastic base to explore the Yasuni National Park. WIth your naturalist guide, head into the rainforest to see many different animals and plants. 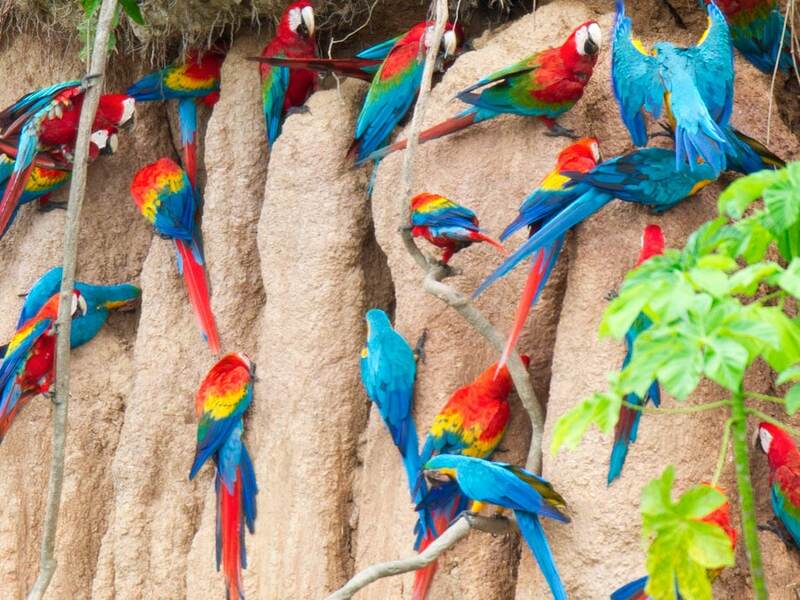 You will visit the Yasuni clay lick to see different colorful parakeets, learn about the Kichwa Añangu community who are your hosts at the lodge, enjoy guided walks around the different trails, and canoe the black waters of the Añangucocha lagoon to see different animals. 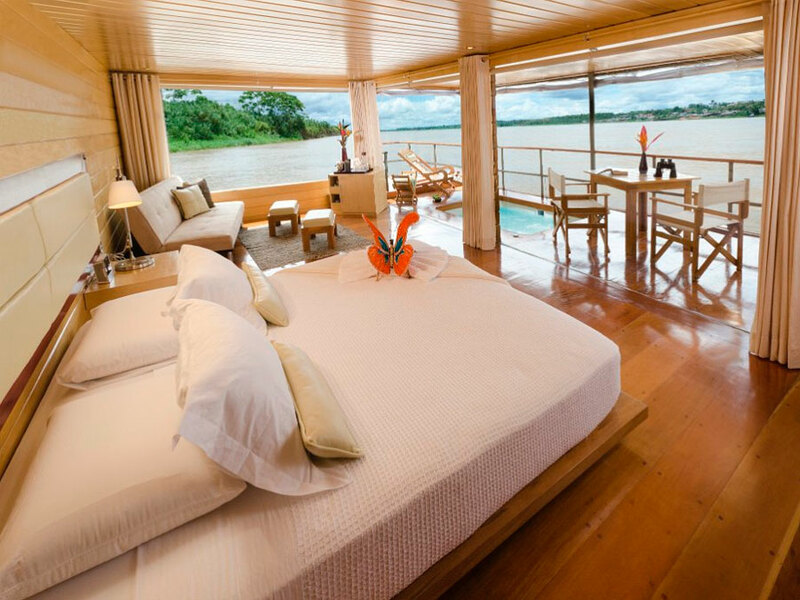 Situated in a private reserve of the Ecuadorian Amazon Rainforest, the Sacha Lodge offers an incredible place to visit. A main attraction here is the incredible canopy walkway, which extends 940 feet (275 meters) through the rainforest and stands 94 feet (30 meters) high. The Sacha Lodge itself was carefully designed to blend with the surrounding rainforest and all the rooms are nestled between the trees. There are 26 rooms in total, which include single, double and triple accommodation (upon request). The rooms feature a private bathroom with hot shower and flushing toilet. All accommodations are screened from insects to keep you comfortable on your stay. As we’re deep in the rainforest, visitors even report seeing animals like toucans, agoutis and monkeys right from their cabin. Other rooms at the lodge include a main bar and lounge area overlooking the beautiful Pilchicocha Lake where you can see beautiful and fascinating birds. In the dining area, you will enjoy tasty food served as three buffets each day. On at least one evening, enjoy a barbecue on the outdoor dining area. You can then enjoy a variety of cocktails, liquors, wine and beer from the bar to relax of an evening. From the fantastic base of Sacha Lodge, enjoy incredible tours in the Amazon Rainforest to find many different birds, mammals, reptiles, plants, and amphibians. The birds are especially interesting and 587 species have been spotted, which represents 37% of Ecuador’s avifauna. As well as the birds, enjoy spotting several different monkeys, fascinating reptiles, caiman crocodiles on night tours, and other animals and plants. Positioned in a private reserve of the Ecuadorian Amazon, Sani Lodge sits in 40,000 hectares (100,000 acres) of untouched rainforest near the Napo River. The lodge is owned and managed by the Sani Isla community who will be your hosts in this incredible area of Amazonia. Over 550 different birds have been seen from the Sani bird list. You will start spotting the wildlife as you begin your journey from Coca and up the waterways to the lodge. Enjoy guided walks through the rainforest to find several different monkeys, interesting birds, rainforest flowers, and the black caiman on night adventures. You will also climb the 36 meter (108 ft.) high Sani Lodge canopy tower to look over the rainforest, which is a great place to spot parrots, toucans, hummingbirds, and colorful tanagers. The lodge itself accommodates 38 guests housed in ten private cabanas with private bathrooms. 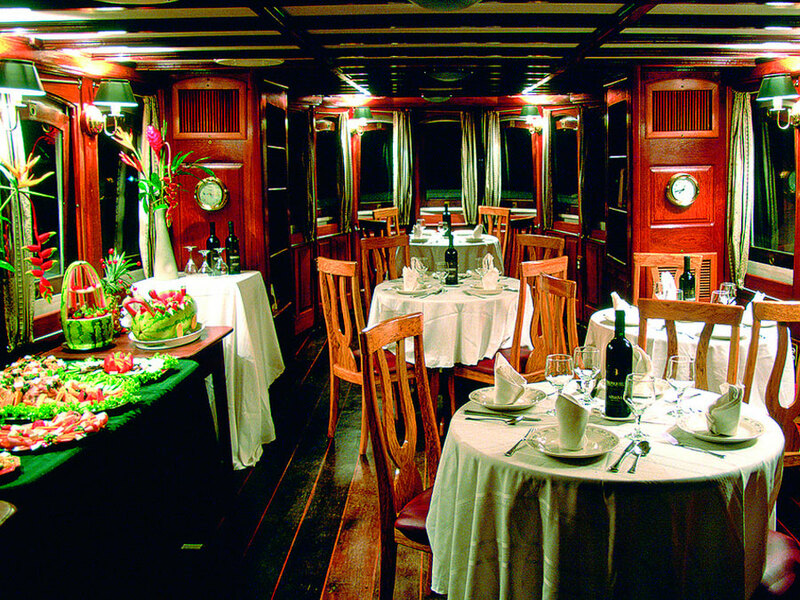 Each offers a personal experience of the Amazon Rainforest with a traditional design. Meals at Sani Lodge are served in the open-air dining room, which provides great views over a beautiful lake. Of an evening, enjoy a drink at the bar while enjoying the rainforest sounds. This is the best place at the lodge to spot different birds and binoculars are available at the bar to see different species. In addition to the interesting wildlife walks around the lodge, you will enjoy kayaking, community visits, and test your hand at a traditional blowgun used by the Kichwa people. An eco-lodge and community focused experience, the Yachana Lodge is a great lodge to learn how local people in the Amazon live their day-to-day lives. Enjoy comfortable cabins to explore the region with guides from the local community. The environmentally conscious construction of the cabins provide great views of the rainforest and river. You can enjoy guided walks to see medicinal plants, trees, vines, and flowers and your local guide will provide information on different flora and fauna. Although you will visit both primary and secondary forest where you will see different animals and many different birds, the focus of this experience is more on the culture of the local communities. In addition to a birding tour, visit a traditional healer, see the Yachana Foundation Training Center, tour a local farm, take a cooking class and see how to make chocolate from locally grown cacao beans to see the economic benefits of this favorite food. And here is the above list again in summary form.